I’ve always known that swimming would be the hardest part of the Ironman challenge for me… I didn’t have the confidence to do a sprint triathlon until September 2013 because my swimming was so weak. I’d also never done any open water swimming until 2013. I started my current job in September 2012 and have membership of the University gym, which includes a pool. I thought I might swim occasionally, but was most interested in doing lunchtime exercise classes. However, I learned that the classes on offer weren’t really what I was expecting as they were too busy, not hard enough, not at the right time and too expensive. In consequence, I decided to start swimming before work as often as possible. I swam less over Christmas 2012 and in January because I kept getting colds, but for most of 2013, I was at the pool three mornings a week. In December 2013, I had to move office and it became less convenient to swim as it was further to get to the pool, I became much busier and there were no facilities to make breakfast near to my office. I’m a very weak swimmer. Between September and December 2012, I started swimming 32 lengths (800m) of “Old-lady breaststroke” every morning – you know the type: head out of the water at all times. Then I found out that prescription goggles are really cheap. Seriously – they’re a 10th of the price of my glasses, even though I was nearly blind. I bought two pairs from Butterflies Healthcare, and they helped to revolutionise my swimming. In December 2014, I took an even more radical step and, alongside my husband, I had laser eye surgery. This has changed my life in so many ways but has also made swimming a less intimidating experience. The first major influence on my swimming was my running buddy, Irene. She is a natural coach who is very reassuring… and the patience she developed helping to teach young children to ski must have come in handy when she was helping me. Before I spent an hour in the pool with Irene, I hadn’t put my face in the water. Well, I tried but had to come out immediately as I was convinced that I was going to drown. Irene reassured me and within the hour, I was able to do some strokes with my face in the water. Less than 8 weeks later, I was happy enough to swim underwater, although nearly a year later I still couldn’t breathe properly. I’m not saying I couldn’t breathe bilaterally, I’m saying that I couldn’t breathe and swim. It was an either-or situation, so I had to learn quickly!!! The video below was recorded in November 2013 at an Embrace Sports triathlon camp. It shows just how bad my breathing was! On my birthday in February 2013, I started having swimming lessons at Southampton University pool. The two instructors (Chris and Anita) were brilliant, so I feel that I made a lot of progress, but in 2014, I decided to transfer my allegiance to Southampton Tri Club. I started open water swimming in May 2013 and found that I really enjoyed it as it’s much more peaceful than being in an indoor pool. It’s also easier to keep swimming when you don’t have to turn around, and it’s simple for other people to go past if they want to. My first open water swimming event was Fowey Harbour Swim, which was fantastic… except for the jellyfish! In July 2014, I entered the Big Cove Swim, which was 1.5 miles long. It was a nerve-wracking event and I was very slow, but I was delighted when I finished as I knew that I would be capable of doing a half iron distance swim (1.9k/1.2 miles). After I completed Weymouth Half, with its turbulent swim, I started to feel that my swimming was improving, although there’s not a lot of evidence of that when you see this video of me swimming in October 2014. I decided that 2015 would be the year that I focused on swimming. 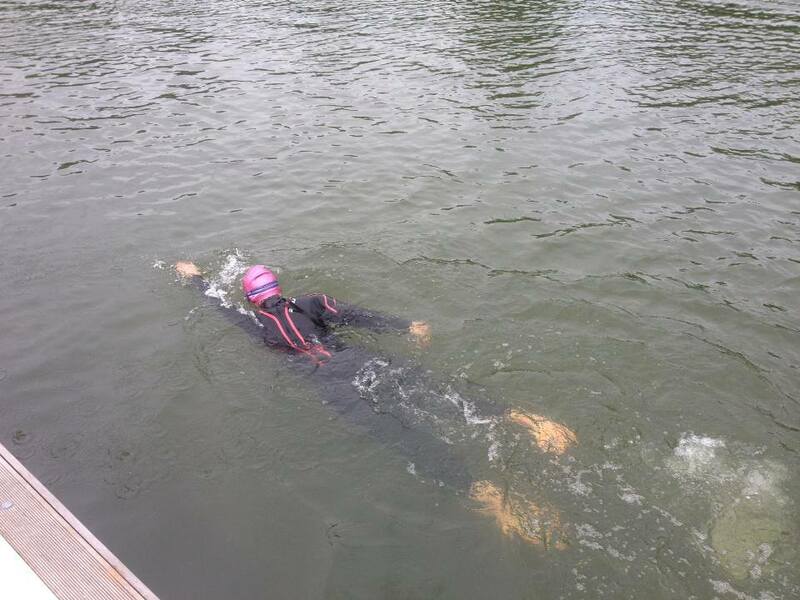 In May I did a 3km swim at Eton Dorney. It was very slow, but it was my longest ever swim. 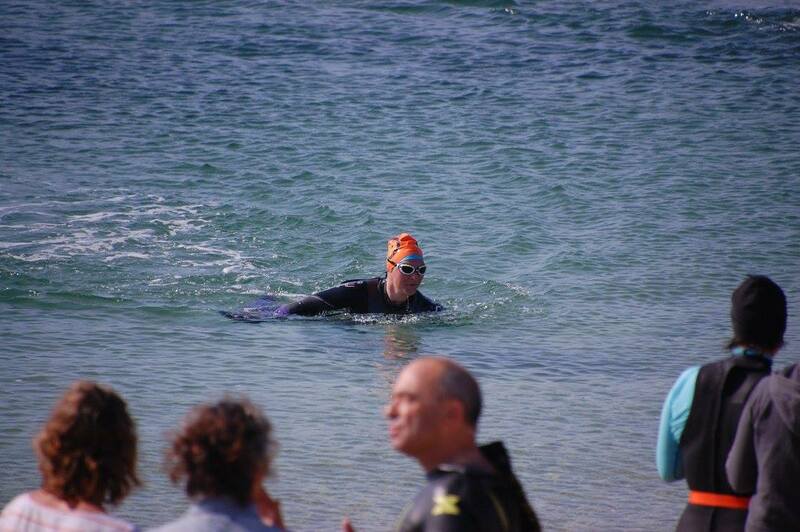 Then in July, I did my first ever 5km swim in a lake followed by the St Michael’s Mount swim the next day. In September 2015, I completed the Scilly Swim Challenge – an incredibly tough series of sea swims, totalling between 15 and 17.5km. I’m still not a strong swimmer and I’m not quick, but I finally feel confident that I can do an iron distance swim within the time allowance and without fatiguing myself too much. I didn’t swim as much as I had hoped to in 2016. The longest swim I did was the Wales Swim (1.9km) as part of the Long Course Weekend. My big swimming challenge for 2017 will be completing 5000m in the pool as an ambassador for Swimathon.